Pancreatic ribonuclease, the focus of highly productive scientific research for more than half a century and the only enzyme to be the basis of four Nobel prizes, has recently undergone a resurgence in popularity for the recognition of an extended ribonuclease superfamily with functions ranging from tumour growth and inhibition to self-recognition and neurotoxicity. This volume highlights the functional diversity of ribonucleases and reveals the emerging research opportunities provided by these enzymes. Escherichia Coli Ribonucleases: Paradigms for Understanding Cellular RNA Metabolism and Regulation. Barstar and Barnase. Rnase T1/Rnase T2 Family Rnases. Structures and Mechanism of Action of Cytotoxic Ribonuclease I-Sarcin. Plant Ribonucleases. S-Rnases and Other Plant Extracellular Ribonucleases. Evolutionary Reconstructions in the Ribonuclease Family. Evolution of Vertebrate Ribonucleases: Ribonuclease a Superfamily. Pancreatic Ribonucleases. 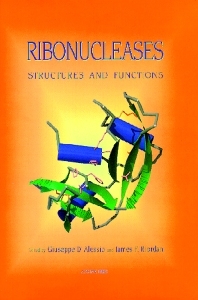 Crystallographic Studies of Ribonuclease Complexes. NMR Solution Structures of Ribonuclease a and Its Complexes with Mono- And Dinucleotides. Seminal Ribonuclease: The Importance of Diversity. Eosinophil-Associated Ribonucleases. Structure and Function of Angiogenin. Antitumor Rnases. 2-5A-Dependent Rnase L: A Regulated Endoribonuclease in the Interferon System. RNA Processing Rnases in Mammalian Cells. Messenger RNA Ribonucleases and Mrna Turnover in Saccharomyces Cerevisae. Ribonuclease Inhibitor. Subject Index.